This handsome little side table was designed to compliment the Volvo Car Seat Armchair made last year. The frame features four curved and tapered legs that reference the back leg / armrest from the chair. They are jointed onto a simple half - lap rail to form a strong base frame for the circular top. The base frame is made from the wood left over from the chair - a nice rich red elm. This contrasts nicely with the Wych elm used for the top which has the characteristic brown tones and green accents. Standing at 50cm tall it is the perfect height to put your cup of tea on while relaxing in your favourite chair. Back in January I spent a couple of days up in Inverurie milling Elm with Keith Threadgall and Tom Cooper. Despite the cold weather we got some good cutting done and graded through 7 tonnes of logs. We were fortunate to be able to pick and choose from 20 plus tonnes of Elm to get a good mix of straight grain, character and burr boards. Lengths varied from 1500 to 2800mm and upto 500mm wide which we cut to our usual sizes of 32, 40 and 54mm thickness with a few boards at 60mm too. Just need to wait a year or so before we can get this into the kiln and dry it down to 8 - 10% moisture content ready for use. Gives me plenty of time to decide what to make from it - any suggestions? One of several stacks of elm nicely stickered for air drying. I like it when I client gives me a challenging brief that requires some lateral thought. On paper this was a simple set of shelves with a mid century modern feel to display personal items and house a small flatscreen tv. The challenge was to make a 4 x 2 meter run of shelves in sections that could be easily transportable and simple to install with minimal wall fixings. Oh and it had to float off the wall to avoid cutouts in the uprights for the skirting board and keep a clean vertical line. Thankfully the client’s design broke down into two main sections - the ‘bookcase’ on the far left and then ‘tv shelves’ on the far right. The section in between is bridged by a series of individual shelves that tie the whole thing together. Each section is comprised of 18mm birch ply components which are either permanently glued together or use ‘knock down’ fittings to join them. The ‘tv shelves’ are made from character elm boards to bring a richer hue to the piece and are profiled with a curve shape. 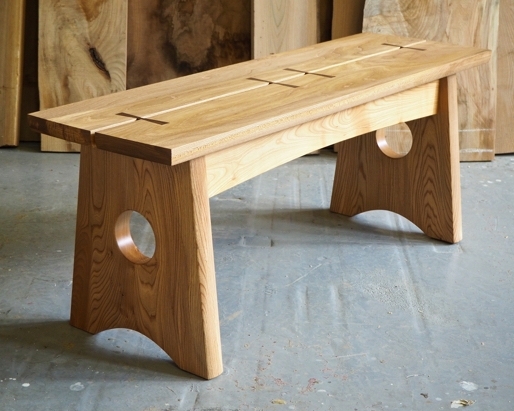 A small coffee table completes the commission with a birch ply base and elm top in a simple mid century style. Birch ply and elm coffee table in mid century style. Sketchup model of the shelves with ‘sketchy’ render. Back in 2015 I made a pair of TopGear inspired carseat armchairs for a client. Well just last week I delivered an updated version of the design. This time for a beloved seat from a Volvo 940, the chair features a laminated one piece armrest / rear leg. This gives a nice swept feel to the piece and a a sense of momentum. Made from scottish elm with oak used for design details and pinstripes. Through wedged tenons have been used extensively to give a very strong frame with a decorative element. The arm and legs have been profiled on the router with a Queen Ann cutter to give a gentle radius to the edge. This gives a real tactile feel to the piece that adds to the overall comfort. Curved armrest / rear leg for ‘go fast’ feel. 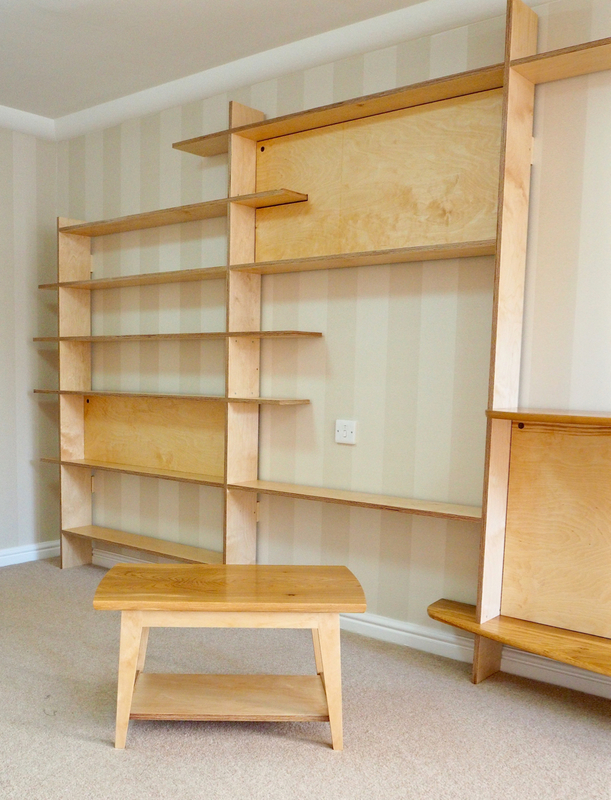 Seven ply lamination in elm with two plies of oak as pin stripes. Front jointed to armrest using a wedged through tenon. Pair of wedge tenons with oak wedges secure the chair stretchers to the front rail. I finished this handsome Dining Bench just in time for this years Scottish Furniture Makers Association Annual Exhibition. A stunning matched pair of elm boards make the seat with walnut dovetail keys tying the pair together. A hand planed curved edge gives a multi-faceted edge to the the seat. This treatment is also applied to the bench frame which softens the profile and encourages you to touch the tactile edge. Handsome bench in elm with walnut dovetail keys. I was browsing in an antique shop in Edinburgh and stumbled upon an old map of Dalkeith. Looking more closely I saw that it had the army camp that forms Newbattle Abbey Business Park in full detail. The woods and grounds are littered with old foundations and bits of drainage etc which obviously once formed part of the camp. This map proved what I’d always thought - the camp was obviously much bigger than it is now. 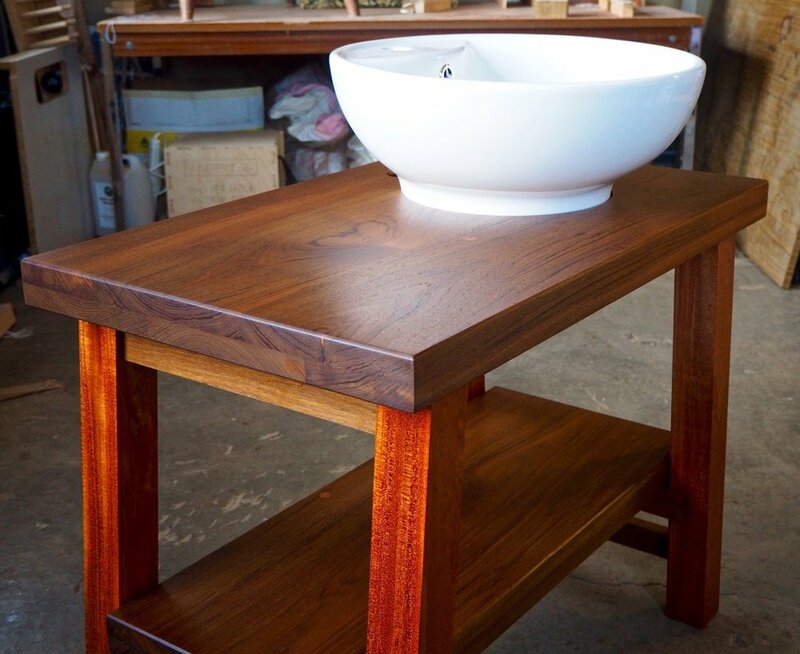 The first project of 2018 completed and delivered yesterday - a sink stand made from the client's own reclaimed teak and mahogany. The brief called for a simple chunky design with angled legs with a single shelf for towels etc. The reclaimed teak looked quite tatty and tired when I picked it up but after scraping and sanding off the old varnish and dirt the lovely rich grain was uncovered. Teak is one of the most oily tropical hardwoods there is and unsurprisingly all the machinery that came into contact with it was coated in an oily residue in no time. It actually machined very well unlike the mahogany -which has a reversing grain. Fortunately the drum sander was ideal for smoothing off the rough surfaces and is a life saver with difficult timber like this. In order to get the thickness required for the tops and shelf I laminated two layers of boards together in the bagpress to give a finished thickness of 54mm. Finished with a penetrating oil (Osmo Extra Thin) the grain really came alive and the contrast between the chocolate brown teak and rich red mahogany worked really well. This was the first time I've used tropical hardwoods for a whole project and it was interesting to learn a few new techniques. Not sure I'd be keen to do more work in tropical timber as I prefer native species but I have to admit that the grain and tones of the wood do look pretty cool. Following on from the earlier prototype I've recently finished another wood veneer lamp. This one is in ash with elm framework and lovely burr elm base. The lamp shade is much taller at 700mm which works really well with the veneer grain running vertically. The ash is a lighter blond coloured wood and lets through more light due to the more open grain. Overall this lamp stands at 900mm tall which is perfect for a feature lamp in a living room or hallway. This commission for set of tables came from a chance encounter with an old friend at Glasgow Queens Street station over 2 years ago. My friend had a neighbour with a walnut tree in their back garden that was due to come down as it had grown too big. Details were exchanged and over the following years I helped arrange for the tree to be felled, planked and carefully dried. The owners were very keen to have something made from it as a memento of the tree that their children had grown up with. Although quite a young tree (in tree years) I felt sure that we would get some usable timber from it. As it turned out the risk was worth taking and the end result was a set of unique tables featuring a homegrown walnut table top(s) and Scottish elm frames. Although not the rich chocolate brown of mature walnut the timber has a lovely woody quality to it and the perfect provenance - from back garden to living room. The design brief was to create a set of tables that could be used as a main dining table and pair of side tables which could be placed at either end of the main table for family get togethers. I've finally finished the lamp that I've been prototyping over the last few weeks. The cherry veneer gives a lovely warm glow to the lamp and contrasts nicely with the ash frame. As a pro-type I've used a piece of sycamore burr for the base - I needed a light coloured base to match the frame. In production I'd probably use elm for the frame and base with maybe cherry or ash veneer for the lampshade. I prefer to limit my choice of timber to one or two species to give a strong contrast. I've got a few design tweaks to make regarding the lampshade frame but otherwise I'm quite happy with how its finished. It certainly looks very nice in our hallway! So remember those veneer rings I made in the last post - thats them underneath all the clothes pegs. Who needs a whole load of fancy clamps (me usually) when a bag full of clothes pegs does the same thing. January - back to work after taking a few weeks off. Ugh. To cheer myself up I'm prototyping a new design for a table lamp. So what's with all these clamps and complicated formers? I'm laminating multiple strips of veneer together to create thin wooden loops. They're only 3mm thick but made from 5 plies of veneer so are really light, strong and surprisingly rigid. The hoops will then be used to form the top and bottom rings on a veneer lampshade using some thin (0.6mm thick) elm veneer. Final Piece of 2016 - TV Cabinet with integrated TV Lift. It's always nice to finish up for Christmas after delivering your last commission of the year. I installed this TV Cabinet with integrated TV Lift yesterday and was extremely pleased (and relieved) it all worked perfectly the first time! The cabinet is made from the client's own oak and features a pair of book-matched doors. The contrasting colour of the heartwood and sapwood have been used to give visual impact to the straight grain wood. An inset finger pull completes the doors and matches other pieces made previously. Although the design is in a more traditional style to my natural edge work, there were plenty of challenges to keep me on my toes. The cabinet houses a 46" tv and is about 1300mm in length - making wide doors requires skill to ensure that there is no movement or warping when glued up and installed. I used quarter sawn oak for the door frames and lid as it is the most stable cut of wood to use. A great end to a difficult year. The After the Storm exhibition at the Royal Botanic Garden Edinburgh gets underway this weekend (3-4 December) with a special Makers' Market. As well as creating the main pieces of furniture for the exhibition using wood from trees blown down at the Botanics when Cyclone Andrea hit the gardens in 2012, myself and several other makers have been busy making a selection of small products from the same timber. 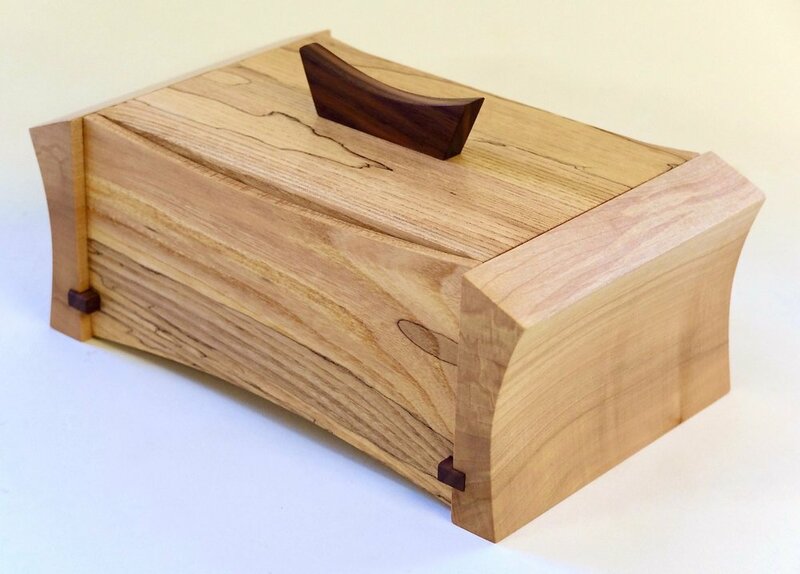 It's been an enjoyable challenge to come up with creative designs on a smaller scale and I've produced a new range of boxes with a natural edge using birch and maple with burr elm handles. I've also made some limited edition clocks and sets of coasters made from oak, maple, elm and holm oak. Myself and other makers will be at the exhibition this weekend to talk about the project and give people the chance to take home their own piece of Botanics. The After the Storm Maker's Market is open from 11am-3pm, Sat 3 & Sun 4 December. The wood shavings have been flying in the workshop while I’ve been getting everything ready for a number of exhibitions and markets. This busy period takes place after quite a long spell of radio silence - I lost my Mum in early 2014 and my Dad passed away suddenly and unexpectedly late last year. As a result, furniture making has taken a bit of a back seat. It’s been a difficult time, but stepping back from work has helped me to rediscover what I loved about designing and making in the first place. I’m enjoying my work and trying out some new styles and methods. I hope you’ll be able to come along to one of the forthcoming events to catch up or see what I’ve been working on. Until Sunday 6 November, (10am-4.45pm [3.45pm 1-6 November]), John Hope Gateway, Royal Botanic Garden Edinburgh. The Scottish Furniture Makers Association’s annual exhibition at the Botanics in Edinburgh is already underway with a new approach this year – work by 26 SFMA members is being shown in four different room sets, so you can get an idea of how the pieces work in situ. I’ve got an elm side table and tea caddy on display and outside you can see a great display of autumn colour. Saturday 22 & Sunday 23 October (10.30am-4.30pm), Peebles Community Centre. This weekend event is a highlight of the Tweed Valley Forest Festival, and the market hosts a number of makers showcasing small products and furniture. I’ll have lots of things for sale including some lovely beech chopping boards with ‘ribbon’ inlays. Outdoors on nearby Tweed Green you can see chainsaw artists, traditional woodworking and a mobile sawmill in action. Saturday 19 & Sunday 20 November (10am-5pm), Border Union Showground, Kelso. This annual event keeps growing in popularity, showcasing quality art and crafts from the south of Scotland. Saturday 3 December – Friday 26 May (10am-3.45pm), John Hope Gateway, Royal Botanic Garden Edinburgh. A special exhibition of fine furniture made of timber from trees blown down at the Botanics when Cyclone Andrea hit in 2012. The show explores the restorative impact of storms as well as the trauma they can cause to the natural and human environment. I’ll be exhibiting an asymmetrical writing desk made of oak, sycamore and cedar from the wind-blown trees. I'll be posting more on this in the coming weeks. I've got a new design of Chopping Boards ready for the Peebles Wood Market this weekend. Made from Beech, each board has a ribbon of contrasting woods running through it - Sycamore and Walnut or Sycamore, Walnut and Elm. An inset handle has been routed into each end which also serves to highlight the different woods. The boards are all finished with a clear mineral oil which is food safe and really gives a lovely smooth finish and rich colour to the wood. Beech is the perfect wood to use for Chopping Boards, it is close grained, doesn't easily splinter and stands up well to knife cuts etc. That's why it has been used for Butchers Blocks for hundreds of years. Also Beech is reputed to be mildly antiseptic which is another bonus. This table features a crisp and elegant frame with curved legs and rails complete with a floating table top. Details include traditional wedged tenons on the bottom of the legs and pegged tenons at the top. I'm exploring a new direction at the moment taking influences from Mid Century Modern furniture and adding the sculptural organic elements of waney edge wood. I've always been a fan of Mid Century design but wanted to do something more than just replicate existing designs. Named after a huge oak tree that came from the riverside area near Jedburgh rugby club, this chest of drawers has been quite a challenge to make. Following on from the conjoined ash console table I made last year I wanted to explore using thick waney edge veneers to add an organic edge to my work. Oak is a mid toned, open grained wood so to contrast I chose burr sycamore which has a lighter colour and smooth close grained feel. The design is inspired by the clean lines of Mid Century pieces which I've given a woody twist by using character grade oak. Through dovetails were used in the cabinet construction with mitred corners added to the front edge to give a cleaner line. The sycamore veneers were consecutively cut from the same board with the top, middle and bottom drawers having one set and the second and forth drawer having another. Applied to the drawer fronts they provide the organic edge that I was looking for and also a sense of depth. To complete the piece, cedar panelling has been used at the back which gives off a subtle aroma whenever the drawers are opened. Another small batch of tea caddies ready for the Aberdeen Arts Fair. This set have walnut lids with a burr elm handle. There are three different boxes - one each in olived ash, pippy oak and elm. Great fun to make and even better to keep your tea bags in... or anything else you fancy really. Handmade Tea Caddies L to R: Pippy Oak, Olive Ash and Elm all with Walnut lids and burr elm handles. The dovetail tails roughed out on the bandsaw. The finished tails cut nice and neat.